Today's one creative thing: I learned a new knitting stitch. It's called the Grecian Rib stitch and I found it over at The Purl Bee, where Laura shared her beautifully tasseled Grecian Rib Scarf. I don't have a project in mind for this stitch yet, but I love learning new stitches -- any excuse, really, to feel the yarn between my fingers, hear the light clicking of metal needles, and see a whole new fabric come to life. Me, too! Love it. It's Koigu merino wool. I've had that particular skein for quite a while, so I'm not sure about the colour. If I'm not mistaken, the yarn is hand-dyed by batch, so I think that no two dye lots are ever alike. It's like knitting with a work of art. Beautifully made. 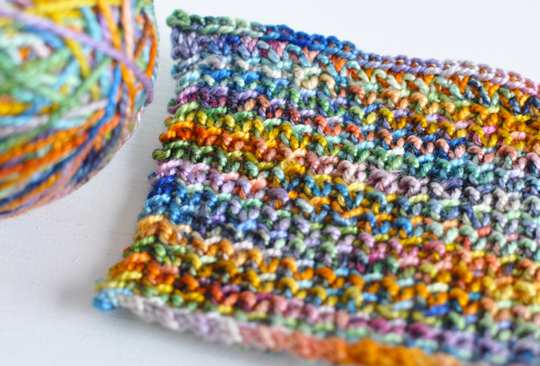 I really like the texture of this stitch! Very cool! Your choice of yarn is also spectacular!